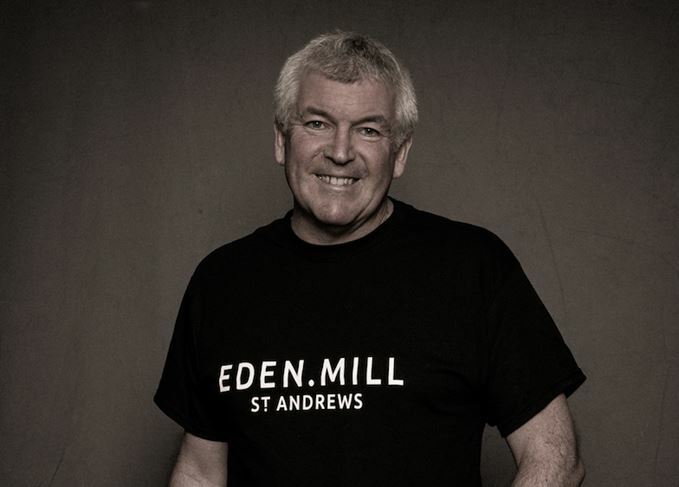 The founder and CEO of Scotland’s only combined brewery and distillery, which only began distilling whisky in 2014, speaks to Becky Paskin about chocolate malt, Eden Mill’s first single malt whiskies and tourism in Fife. ‘We were really conscious of criticism of high-ticket first bottle launches, and we wanted to get our limited amount of juice out to as many people as we could, so we decided to do smaller bottles of really interesting single cask expressions for what we’re calling the Hipflask series. Really this is the thing we want to be famous for, the fact that we do interesting things. ‘We’ll release another three or four bottles in a few months and another few after that, and it will just be an ongoing thing whenever we find some interesting casks. We’ve already got some Port casks, some pale malt, some very peated malt and different wine casks lined up. ‘We’ll keep the price at around £25 for 20cl and then that way people are able to afford that and get something different. There will be cheaper whiskies in the market, but it’s something different and a bit interesting, and not a crazy price. ‘I’ve been in the industry for 37 years; started out with Oddbins, then worked on IDV, which is Diageo now, I guess. I worked there for 10 years, a lot of that time in new product development, but not directly involved in whisky. Then I moved to Glenmorangie, but in those days it was called Macdonald and Muir. I worked there when they bought Ardbeg and released the different wood finishes, so it was a really exciting and interesting time. ‘Initially when we bought Ardbeg I was wondering what we’d paid £7m for, then we were spending another £7m on developing the visitor centre, and initially I thought it was mad. But the very first time I went to taste Ardbeg in Sweden, I realised how unbelievably passionate Ardbeg’s followers were, and just what an absolute gem it was. It was the ultimate steal in terms of paying that amount of money for something with that potential. ‘Ironically, the inspiration for creating Eden Mill actually came from Pete Coors, who owns the biggest brewery in the world. At 3am in the Old Course Hotel, he said to me: “Paul, tomorrow can you take me to the nearest distillery or brewery, because I’m not going to play golf tomorrow?” and I couldn’t think where the nearest distillery or brewery was, and I’ve lived in Fife most of my life. ‘So we could only really start a small brewery knowing we’d have to move, but what was really quickly evident was we had loads of people really interested in coming and buying something that was authentically made in St Andrews, and enjoy a visitor experience that was more than just golf. ‘That then meant that, even though the university wasn’t certain about where we were going to be, we knew we had to build a small distillery because that was an opportunity early. So we decided to create an interim solution, to create a microdistillery where we could make single malt whisky and align it with making beer as well. Gin at that time was just beginning to become really interesting, and we felt we could do something with gin as well. ‘When we originally started looking we had no idea this was the site of the old Seggie distillery. It was pure chance; good luck. A few people came and told us it had been a big distillery in the past. We were actually at that time – because we were a brewery – more interested in the fact that it had originally been a brewery. Then, when we dug a bit deeper, we found all the archives of the financial comings and goings of the Haig family back in the day, which are in themselves an interesting read. ‘Eden Mill is the only single-site brewery and distillery in Scotland. I don’t know why that is. It’s quite hard to run the two side-by-side, although they’re complementary. Perhaps the complexity puts most people off, but we think it’s part of the charm. ‘Being able to use different mash bills that include some of the barley types that are used for brewing in creating our spirit is interesting and quite quirky. We’ve got a team of really passionate brewers and distillers. Brewing gives them the opportunity to get the fruits of their labours very quickly, whereas making whisky you’ve got significantly longer to make that. ‘The area of our different malt types was something the SWA [Scotch Whisky Association] were concerned about insofar as they couldn’t be certain that they wouldn’t dramatically alter the flavour of the spirit. So they’d said they weren’t too happy about us using chocolate malt to a significant extent. It adjusts the flavour no more than a particular cask type would do, so for us we just need to try and ensure we get the balance right in terms of the chocolate malt we use within the mash bill or spirit we’re making. ‘What we’ll typically do is distil the chocolate malt out and add a percentage of it to create a blend which we then put into a cask. That means we are a little bit more in control of the impact on the spirit. We feel that way we can provide something that is clearly fitting within the Scotch whisky criteria. ‘I’m not sure how they police this; I don’t know who is the ultimate arbiter of what does and doesn’t reflect Scotch whisky. We will do what we think is reasonable in the context of our vast experience with whisky, and hopefully people will be happy with that. It’s not as cut and dried as with labels, where the rules are really clear. The rules regarding the flavour profile of whisky are probably a bit more of a grey area, and the proof will be in the eating. ‘The exciting thing about moving to the new site [at the back of the existing distillery] is that we will be able to produce a lot of our standard single malt. We want to keep our three small stills so we can still do the interesting and slightly weird stuff there as well. Consumers are quite promiscuous and want to try the next interesting thing, and what we take great delight in is opening up the bonnet and showing people how it all works, and letting them see it for real when they come on our tours. ‘Up until recently, a very small number – about less than 10% of the people who come to visit us – are whisky drinkers, mainly because we haven’t really pushed the whisky aspect of things and we haven’t really had a list of whiskies to sell. Now the challenge is that there are fantastic distilleries out there doing great whisky experiences, and so we need to offer something special and different that they can’t get anywhere else. The first whisky to be distilled in St Andrews for nearly 160 years earns £7,100 at auction. The experimental Fife brewery and distillery intends to produce more whisky, gin and beer.